Beautifully ornate and designed to the highest standards of tonality and playability, the Taylor 910 is the flagship instrument of Taylor guitars. The combination of solid rosewood bodies with a solid spruce sound board in a dreadnought size has proved a very enduring configuration for six string and twelve string guitars all over the world. When you purchase your Taylor 910 you're not just getting the classic dreadnought design and much loved sold rosewood and spruce combination, you're getting a very elegant and ornate guitar with the best hardware and cuts of woods available to one of America's largest and most prestigious guitar manufacturers. This Taylor 910 guitar isn't something one would purchase save their wanting and needing the very finest sort of acoustic steel string guitar available. The Taylor 910 is just that sort of instrument, and should it be cared for it will outlast a man or woman's life, and then become a cherished heirloom and amazing musical instrument for someone else, and then again many times over. It's impossible to get a "better" solid rosewood and spruce guitar than the 910, one could only have different tastes and preferences. The body of the 910 is of solid East Indian rosewood, and of course this has been the primary rosewood used for rosewood body guitars since the 1970's. The 910 is available with a Brazilian rosewood body, but of course you can expect to pay a lot more for that instrument, as Brazilian rosewood is now very rare and hard to come by. Rosewood body guitars always have darker tonal characteristics than do mahogany body guitars. Rosewood provides a lot of overtones when playing, and a guitar such as these 910's should only be purchased if one first knows for certain they prefer the sound of a rosewood instrument to that of a mahogany body instrument. The top of these fine guitars are of sitka spruce, but only the very best cuts of sitka spruce are used on the flagship dreadnought by Taylor. So while one should always be aware of the tone wood used for the sound board of an instrument, they should also know that no two sound boards are equal for merely being from the same species of tree. These instruments can be purchased with Adirondack spruce tops as well, but the most of them will always come with sitka sound boards, and one should absolutely know that instruments featuring an Adirondack or red spruce top are going to cost more for having that tonewood. These lovely Taylor 910 guitars all come with a solid tropical mahogany neck, and a gloss finish. Taylor engineered its own gloss finish. It's said the new Taylor gloss finish is more environmentally friendly than was the previous lacquer finishes used, and also provides superior protection to the instrument. The Taylor 910 is, of course, available in a left handed model, but you're unlikely to find a left handed one on every showroom floor you go guitar shopping at. You can always contact Taylor directly in order to get a left handed model, or order one through a dealer of fine musical instruments. 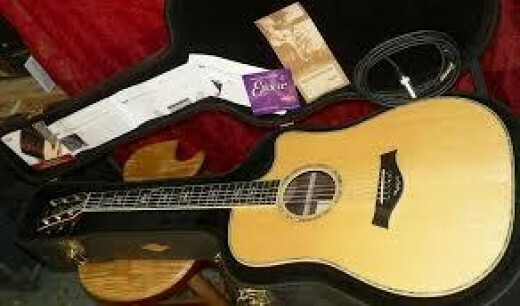 Most Taylor 910's I've personally seen were acoustic/electric models with the Taylor Expression System on the guitar. It is also very common to see Taylor brand instruments with a Venetian cutaway AND the fine electronics inherent to the Taylor Expression system. Solid Sitka spruce top, and the best cuts or AAA grade cuts are used as sound boards on the Taylor 910 guitar. For an additional cost these instruments can be purchased with Adirondack spruce sound boards. Sometimes Adirondack spruce is instead called "red spruce." Solid tropical mahogany neck with black ebony fret board or finger board. Taylor's CV bracing with relief route. Rosewood binding with red purfling. Since the very beginning of production of the famous Martin dreadnought guitars, the D-45 has been their flagship instrument. When one sees the "45" after any letter used to describe a guitar produced by C.F. Martin & Company, one knows the guitar is going to be rosewood body, spruce top, all solid woods, and dressed up as if it were going to a wedding. In the beginning all Martin rosewood body guitars were of Brazilian rosewood, but after a time and the un-sustainability of the deforestation in Brazil, that peculiar and special wood was replaced by a different species of rosewood, and to this day East Indian rosewood is the most common rosewood used for such instruments. While East Indian rosewood is a very fine wood, it is now to the point to where there are untold thousands of fine instruments with bodies made from it; and persons who seek to stand out from the crowd with their guitars have demanded more options. Everyone loves options. Having more options is generally a superior situation than having fewer options. With the Martin D-45, there are many options available to the consumers of such fine instruments, and the Madagascar variety of rosewood in the body of a D-45 is now one of them. Insofar as solid spruce tops go, the most D-45 Madagascar instruments will ave the Adirondack spruce top. Sometimes Adirondack is referred to as "red spruce." There are some rarer D-45 Madagascar instruments that have Italian alpine spruce tops. These D-45's with the Italian alpine spruce tops and the Madagascar backs and sides are available as a special order, and are commonly called the 1968 D-45 replica. A Martin D-45 Madagascar is only available with Italian alpine spruce tops or with Adirondack spruce tops. If one wanted a very similar guitar with a sitka spruce top, then they could purchase a D-42 Madagascar which does have a sitka spruce sound board as a standard with an option for an Adirondack top. You can see in the photo above the fabulous binding and inlay around the back of the D-45, and the particular image above is of a Madagascar rosewood instrument. It is a lighter color wood than its East Indian cousin is in general terms, and there is a hint of orange or yellow in the grain. 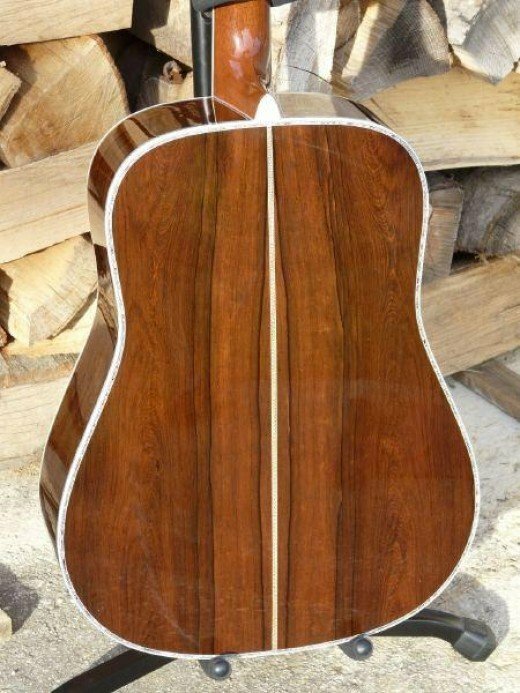 Like Brazilian rosewood, however, the Madagascar variety has a wide range of possibilities in how it will look whereas East Indian most always looks very similar from one instrument to the next. There is a lot of talk on the web and around jam sessions about the difference between the sound produced by Madagascar's rosewood and the East Indian variety. I'm very certain there is no person who could, when blindfolded, consistently hear any difference whatsoever between the two woods. Once you've got an steel string guitar of all solid wood and a rosewood body, the defining things regarding how it sounds are going to be the internal bracing, the wood used for the sound board, and how old the instrument is, and how often it has been played. With Brazilian rosewood there may actually be some noticeable differences to the tone from either of the other two rosewoods; but one must take a great leap upwards in spending to own the Martin D-45GE with Brazilian back and sides. Of course all new D-45 guitars feature Martin's famous pre war style forward shifted high X bracing. The necks of these guitars are solid mahogany with ebony fret boards. The width of the guitar at the neck has the option of being either one and eleven sixteenth inches at the nut, or you can order this guitar with a neck width at the nut of one and three quarters. You can even order this instrument constructed with Hyde glue. 900-piece abalone bindings and inlays, Abalone logo on headstock, Bound ebony fretboard,Rosewood sides and 2-piece back includes deluxe Martin hardshell case. This is the top of the line dreadnought guitar from the most prestigious guitar builders in the world today. I've only ever seen one Martin D-19 in my life, and I didn't even get to pick it any. I didn't get to even touch it. I asked about it, and saw it on a Gaston road pawn shop in Dallas, Texas, sometime in the late 1990's. It's a very rare guitar, the D-19. Traditionally, Martin solid wood dreadnoughts or smaller or differing sized instruments start with the number 18, which means the guitar is a mahogany body instrument with a solid spruce top. Following 18 series guitars one then jumps to 28, 35, 41, 42, and then ends at 45 series; but that is only traditionally, and Martin has added new series of guitars along the way, discontinued them, and since added 15 and 16 series guitars, and hopefully those will be here to stay. Yes, thank you, I know about the 17 series, I own one. I also know about the 21 series, but I've never seen one of those. I have seen just the one Martin D-19, and boy do I ever wish I'd bought that guitar! When we look at the D-19, it is important to realize what we are seeing is something unlike other Martin flat tops, as what our eyes see is something very similar to instruments like the Martin D-17, or the D-15, but this is not due to the tonewood used for the top, it is due to the stain finish. C.F. 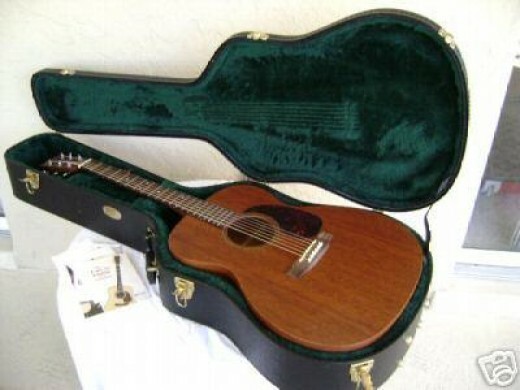 Martin & Company introduced the Dreadnought D-19 flat top guitar to the world in the year 1976, and apparently the year was during a time when Americans had some fascination with the color brown. I've read Fender, Gibson, and Guild guitars were all also following the craze, and putting out new guitars with more brown, and less of creamy spruce color on top. I'm thinking the year was good for high quality finish/stain sales too. Martin produced the D-19 all the way through 1989, but in some years there's data to show they only produced in the range of 50 of these instruments in a year's time. When it all is said and done, the D-19 is really a Martin D-18 with some dark stain on the spruce top with a D-28 style rosette, and some nice white purfling around the back. These instruments can be found online for around $3000 in good shape, or less should they be a bit scuffed, and maybe need some minor but expert repairs done. While these guitars are very nice looking, and very collectible, Martin guitars from the 1970's have at times been considered inferior instruments to other decades, and especially when compared to a Martin made from the mid-80's to now, or before the 1970's. 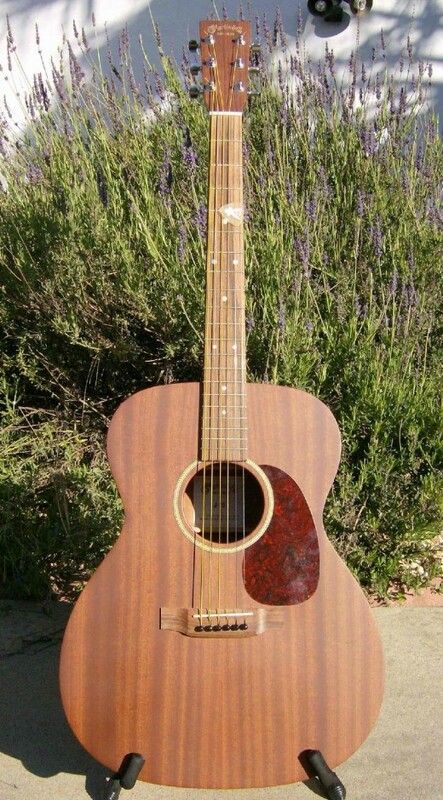 It is certainly important to know that these Mid-1970's Martin dreadnoughts DO NOT HAVE the forward shifted and scalloped bracing of the newer Martin guitars, or the Martin's from what is often referred to as the "golden era," and so they simply will not have the volume, clarity, and sustain of such instruments.If what someone is after is both a Martin dreadnought and a dark appearance to set themselves off with looks, then the interested party would do much better, in my opinion, buying a D-15M, or a D-17 if they happened to find one, depending on how much they were willing to spend. It should absolutely be noted and also be rather apparent, these guitars will sound a lot differently. Nothing, in my opinion, sounds quite like a D-18, and the all mahogany D-15M or D-17 wouldn't sound nearly the same, but one may PREFER the all mahogany sound. The D-19, of course, will by and large sound identical to the D-18. One thing that comes to mind here, and should be thought of for the very serious man or woman interested in such guitars is there's no possible way the dark stain could NOT affect the tonal characteristics of this guitar in some way. Most guitar tone comes from the topwood, or the tonewood used for the soundboard. Staining a soundboard will absolutely affect the sound; but it could be such a small thing the blindfold testing of D-19 to D-18 would conclude for one the differences are essentially not observable. Some folks have better ears than others though, no doubt about it. Another thing which comes to mind here is that there are lots of us out there who're a bit "handy" at doing things, like to do things ourselves, and often simply can do outstanding work, even if we've never done that kind of work before. The D-19, however, was created by some of the best in the world, and the idea that one might have of refinishing their fine spruce top guitar to make it look like a D-19 is just a really bad idea. I'm not saying it can not be done, I'm saying only a truly and stupendously foolish person would attempt to refinish a fine guitar without having first experimented many times on such a project with much cheaper instruments - but I'm a pretty opinionated person, and that is my opinion. Thanks for reading. Robert Johnson is as iconic as the day is long. You should never believe such things, but he's the US version of the guy who sold his soul to Satan in order to get mastery of a musical instrument. The legends of people trading souls to the dark one for gifts is ancient as the hills. There's no reason Johnson would attempt such a thing, or that such a thing is even remotely plausible to begin with. He'd had Son House as a teacher of guitar. Son House was not the sort to cotton to the devil, but what do I know? I know people like their legends. There is a statue which states he had done the deal with the dark lord. Something written in stone isn't all it is cranked up to be. We Americans seemed to need such a tale, however; and Johnson's prowess on the acoustic steel string guitar inspired many another guitar playing legend. He only ever recorded twenty nine songs. One of them, of course, was about trading the metaphysical to old scratch for legendary skills. 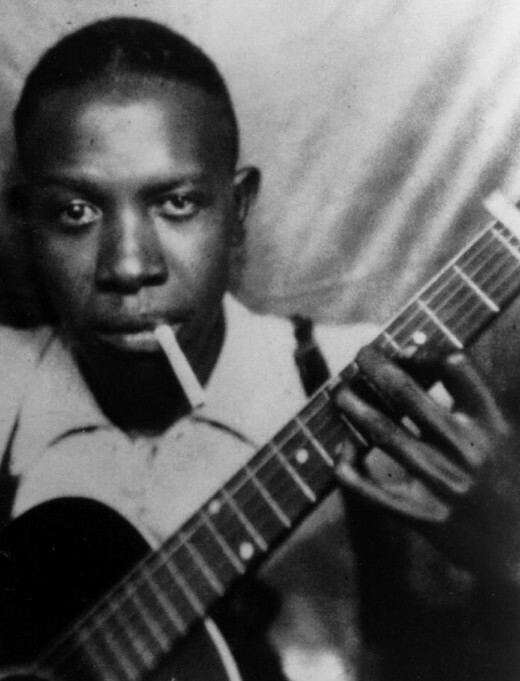 Robert Johnson died at the age of twenty seven years a long time before that, too would be cool. He lived the same length of time as did Jimi Hendrix. Hendrix may have been Johnson reincarnated. Hendrix, however, got a lot more done. Johnson mostly bustled for bucks, and played in juke joints when he could. He died having experienced none of the fame his music brought. His fame was all posthumous. In 1961 his 29 songs were re-released on an album titled, 'King of the Delta blues Singers.' There are many distinct styles of blues music, Johnson's was the Delta Blues. Rural black blues musicians often believed mastery of the blues would give them mastery of their woman of choice. Well, that isn't so surprising. Using music to woo an object of physical desire is also, as old as the hills. Robert Johnson was well thought of by his peers. People interviewed about him often said he was a nice, but kinda strange guy. The deals with the devil tales seemed to have stemmed from Johnson having been well known to be a good harmonica player, but a terrible guitar player. He was thought to have been fairly embarrassing on the guitar up until a point where he disappeared for a while. The next time people saw him he suddenly had the guitar mastered. The people who did know about Robert Johnson when he was alive, and after he'd mastered the guitar, those people say they respected him the most for his ability to seemingly be able to play something after hearing it for the first time. In other words, he was one with that rare gift of ears which can just hear and know where on a fingerboard to find the notes to play a thing. He was said to perform in any style you could think of. So Johnson was better than what the mere 29 recorded songs can show us. From what we do have, his guitar playing was frantic, his singing tortured with anxiety. Take a look at Robert Johnson's hands. His fingers look like they're longer than the average person's are. Those are hands which were born to play a guitar. You listen to his music, and you notice he plays a percussive lead rhythm sort of style. What I mean is, he's not hitting single notes very often. He's not strumming full chords all that often either. Almost everything he plays is two or more strings at once, but seldom does he strum a five or six string chord. It makes for a very full sounding accompaniment to his singing. 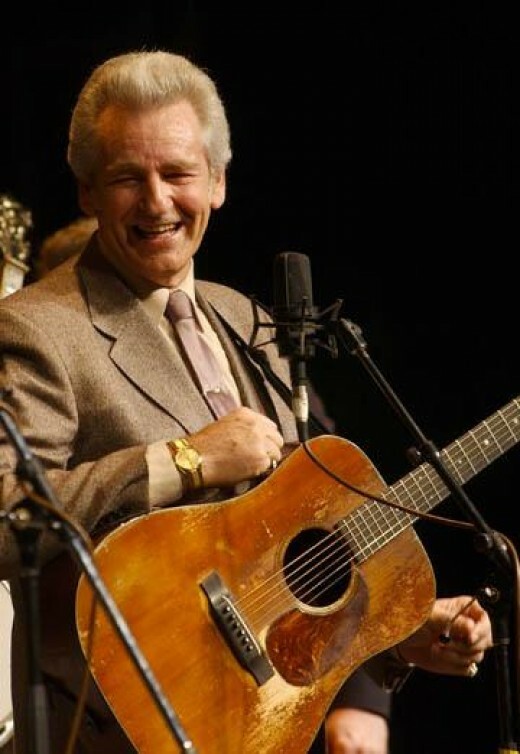 Johnson would often sing a line, then use his guitar to mimic a second singer in a call and response sort of style. B.B. King would learn this technique, and use it his entire career and life. Johnson very often used a slide, but he was such a busy player, moving around all over the fingerboard, he could trick a listener into thinking they were hearing more than one guitarist. His singing style was just as advanced, nuanced, and influential as his guitar playing. People can try to copy either of his techniques, and never come close. Some people just have that unique gift, and Johnson had two of them. He died in Mississippi of unknown causes. Some say he was poisoned, others say he died of syphilis. The year was 1938. Was Robert Johnson the father of rock and roll music? His style certainly would have been called that were he to only have lived a couple decades later. As it is he helped spawn countless influential bluesmen and rock and roll guitarists. There are many scholarly books on the subject of the man. His guitar of choice? It was a Gibson L-1. 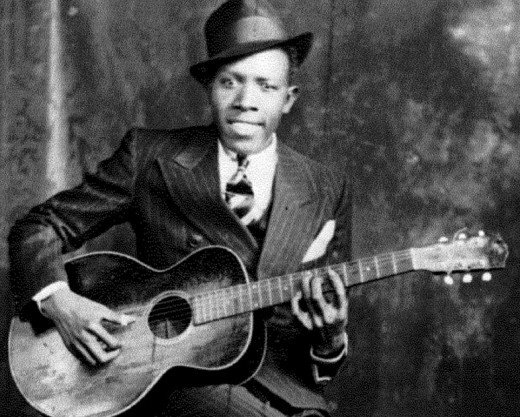 While Robert Johnson had spectacular talent, there can be no doubt his guitar played a big part in helping deliver that sound which inspired so many, and continues to do so today. The guitar was a Gibson L-1, and Gibson has recreated the L-1 of so many years ago so that you too can own a guitar like the King of the Delta Blues used to play. But this is really a recreation plus some new things, like electronics so as to plug into an amplifier. 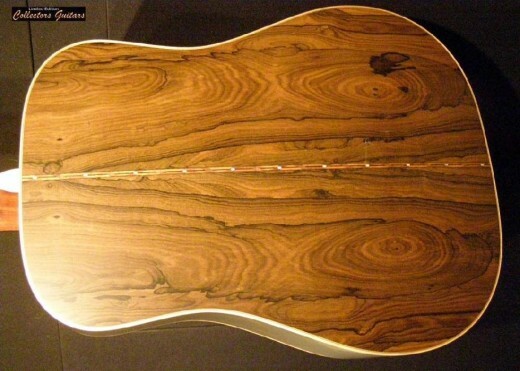 In 1928 when Gibson used spruce for a guitar's soundboard, they used Adirondack spruce. Adirondack spruce is a premium wood today. You have to pay more for a guitar with an Adirondack soundboard. Usually upgrading from Sitka spruce to Adirondack spruce is a cost increase of around a thousand dollars. Gibson is thermally curing the wood before it is used, so as to mimic old wood. It is a general truth that older wood produces more sound, and Adirondack is often thought to produce more volume than other species of spruce. The Gibson 1928 L-1 Blues Tribute is one of the finest new, small body acoustic electric guitars available today. Gibson uses German Plek technology to ensure their fretboards and frets are as accurately and perfectly done as is possible. The braces are scalloped, and all guitars this fine are going to be fragile works of art used to create further works of art. Nitrocellulose lacquer is used for the finish. This is something expensive and labor intensive to apply, but it ensures the wood vibrates to its maximum capacity for sound production, and that the guitar shines impressively when polished. This guitar's width at the nut is wider than most, so it is important to know your hands are large enough to wrap around the neck. There are just twelve frets clear of the body here, and such guitars are known to project in a different sort of tonal manner than the now standard 14 frets clear of the body guitars do. The electronics are by L.R. Baggs, and these include a pickup and pre-amp. I'm surprised these aren't selling for more, but how long Gibson will produce them is anyone's guess. We lost a lot of musical celebrities in 2016. 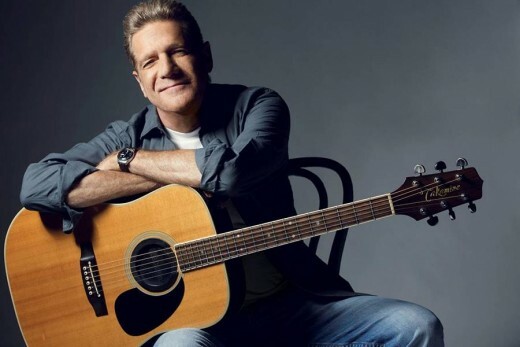 Glenn Frey was maybe the one who meant the very most to me. 2016 will long be remembered as a year when a lot of celebrity artists died. 2017 will likely be just the same way, as the baby boomer generation is experiencing the effects of father time. Maybe 2016 will be remembered as the year when the baby boomers started dying in large numbers. The thing about the musicians who passed away in 2016 was the deaths were pretty unexpected. David Bowie apparently knew he was dying, but he never let anyone outside his inner circle know about it. The death of Prince was a shocker because he was quite young, and because of strict adherence to his religion, nobody considered he'd be a guy battling an opiate addiction. I'll make no bones about it, Prince was a stupendous guitarist, he was as good as you can get. At least there aren't many people more talented at it than he was. David Bowie's classic rock was something I always enjoyed too, but the death which bothered me the most was the death of Glenn Frey. I've always thought of myself as a bit of a redneck. I prefer to be out in the country where I could go outside and shoot a squirrel or whatnot, with a shotgun, and nobody would think anything of it. As a country sort of guy, the music of The Eagles, something which is really country rock, was like a constant companion. Glenn having passed away isn't going to change any of this, The Eagles and their awesome twang rock is here to stay. It's the kind of music a body can sing along to, even when you are like me, and can't really sing. 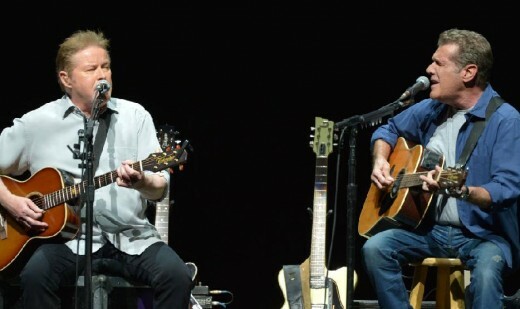 Glenn wasn't the only vocalist in The Eagles, of course; but those guys were putting out singing in their songs which wasn't so technically challenging you didn't bother to try. The Eagles were a band where roles were loosely defined. They were like The Beatles in that way, you never know who's going to be the singer for the next song, because everyone in the band can sing quite well enough. So too with the guitar. You know Joe Walsh was the primary guitarist, but even Don Henley, the drummer, would play a guitar when the time was right. As a Texan myself, I can tell you Don Henley, who is from here, is almost as Iconic in these parts as the great Willie Nelson. Texans love our fellow Texans. Me, I'm a heretic, and lucky to have not been burned at the stake, I always liked Glenn Frey songs better than Don Henley songs. I just loved Glenn's voice and his vibe, he could give me a peaceful, easy feeling, if you follow me. While we're on the subject of diversity in entertainment roles, let us not forget Glenn Frey had been an actor too. After years of Frey and Henley doing a Lennon and McCartney sort of partnership, the good times ended for a while. The great Bakersfield sound of The Eagles landed, or went to roost. Glenn had a successful solo career too. Glenn got older, and died way too young, at just 67 years. He was worth ninety million dollars. His music was the soundtrack to countless lives, including mine, and maybe yours too. 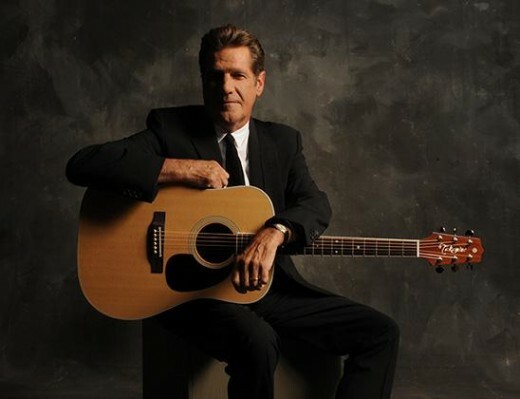 Glenn Frey could own any guitar he wished. He still chose Takamine. When you're a guy like Glenn Frey you play whatever guitar you want. Glenn could have been playing the most expensive guitars Martin, Gibson, or Taylor could produce. But he did not, he played Takamine guitars. That really tells you something, or at least it should. Takamine is a damn fine manufacturer of acoustic guitars. For long years people in the know have known about the great quality offered by Japan's Takamine. They are named after a mountain in Japan. They provide Martin level quality for less dollars than that upscale stalwart of US guitar manufacturing. The craftsmen and women of Japan will never shame themselves, they don't build a thing unless they're going to build it right. Takamine makes some less expensive models, student level or amateur level instruments, this is not one of those. This guitar is a rosewood and spruce dreadnought with electronics. One could say, and be very correct, that it is a guitar much in the vein of the Martin HD-28, but with electronics added, as Martin isn't so much into putting pickups and such into their world renowned classic models. Specifically, this guitar is known as the EF360GF. The 'GF' are the initials of the guy who it is made for. These aren't cheap, but they aren't expensive either. They regularly sell for around sixteen hundred dollars, and will hold their water with any rosewood and spruce Martin or Taylor dreadnought. You can hold me to what I'm saying when I'm talking about fine guitars, friends, I'm a full throttle addict of such information and things. Rosewood body acoustic/electric dreadnought guitars are always going to be something used by the singer songwriter, and the reason is they offer so much in the way of accompaniment. Rosewood provides a dark, overtone laden tonality, and the spruce provides volume and clarity. The guitar would be equally terrific for rhythm and lead duties. Rosewood and spruce dreadnoughts are the stuff of Appalachian bluegrass music royalty. A guitar never cares what music one chooses to make with it though, it just wants to be played. On-board here is the CT4B pre-amp, and this includes a three band graphic equalizer. Takamine's electronics for acoustic guitars are superb in every way. They are truly surpassing some of the long standing big names in that particular game. Because Takamine's electronics are so very good and useful, they're more competing with Taylor guitars than anyone else these days. That invisible hand of the market, you know, serves to give us what we both want and need. Also included is an extremely useful and accurate chromatic tuner. This guitar, as most other Takamine steel string offerings, features the X bracing made famous and nearly universal by C.F. Martin & Company. What the bracing translates to for you, is the guitar will be pleasingly loud when played acoustically, not plugged into anything. The nut is of genuine bone. I can't say enough how great it is when a guitar manufacturer uses bone instead of some sort of plastic. Bone nuts absolutely make a steel string acoustic guitar both louder, and the notes clearer. The bone nut will also, naturally, increase the sustain of the notes played. This guitar comes with a hard shell case. Glenn Frey is gone, but never forgotten. Who knows how long Takamine will produce this instrument? I sure wish I owned one, and if you are into steel string guitar, then you definitely wish you had one too. That the music of Nirvana changed the music scene when it became popular in about the year 1993 is unquestionable. That Nirvana was most often a heavy hitting electric band full of screaming guitars, vocals, and thumping drum and bass rhythm section is also simply fact. The very last album by the band which put grunge music on the map, however, was an all acoustic album. MTV Unplugged In New York was that final album, and that is where Nirvana left us forever, with a brooding, depressing, beautiful acoustic album. While the unplugged genre of live albums was becoming a thing rather popular for otherwise plugged in bands or artists to do, it was also something which allowed us to see such musicians were actually capable of playing in other formats. There's really a bit of a transition to deal with for a guitarist when switching from electric to acoustic guitars. Oh they're the same instruments, but the acoustic variety of guitar requires the use of much bigger strings, and those put a lot more stress on both the picking or strumming hand, and especially the fret board hand. Kurt Cobain, however, was always primarily a rhythm guitarist on either electric or acoustic. The MTV Unplugged In New York album by Nirvana would prove to be their swan song. The music was mostly a mix of tunes which were written by other artists, and a few of the band's own lesser known songs. It gave us all a new way to think of those three musicians we thought we'd known so well, and a chance to literally hear what it sounded like for Kurt Cobain to say "goodbye" to us all. The live acoustic album by Nirvana, their final album, sounded terrific, and it still does. While it would be near impossible to duplicate the emotional vocals and quirks presented in the show by Kurt Cobain, what isn't impossible is to have the same guitar as he had. The guitar is a Martin D-18, one of the most admired and famous acoustic guitars in the world. The exact year of Kurt's D-18 is 1958, and this guitar is extremely rare. This guitar, with three pickups on it, isn't something one is ever likely to come into contact with; and so it is a very collectible instrument. The three pickups are two DeArmonds pickups, and one Bartolini pickup. 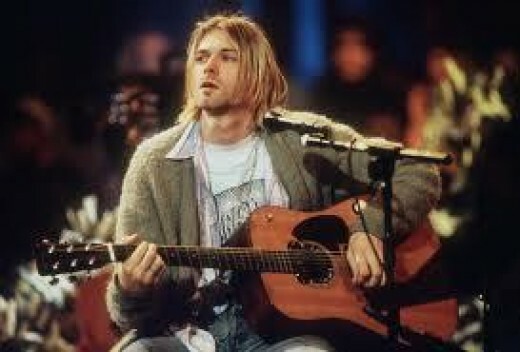 It is rumored that during the MTV Unplugged concert, only the Bartolini pickup was working for Kurt. Another thing which is perfectly obvious from the images is this specific instrument is a right handed model. Kurt Cobain was a left handed guitarist, and so he simply flipped the stringing of the instrument around to where it would be normal for a left handed musician to play. I'm told Kurt's setup was stomp box distortion pedal ran into a Fender SF Twin Reverb amplifier The thing most important to note here is that the 1958 D-18e was a very good acoustic guitar with very old and not so wonderful pickups on the thing. 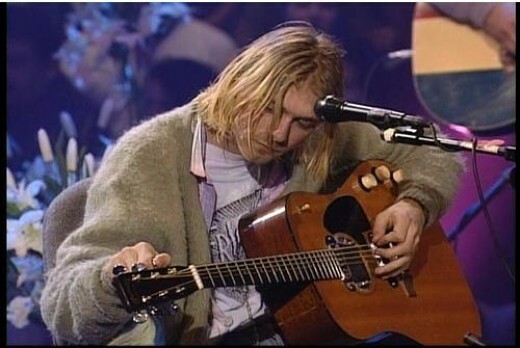 If someone wanted to achieve a sound comparable or even superior to what Kurt had achieved in the Unplugged In New York concert, they could do so with a much less expensive and more modern instrument with modern pre-amp and pickups on the thing. So far as alternate guitars built to Martin D-18 specifications but sold at a far more reasonable price goes, I will forever and ever advise one to purchase a Blueridge BR-140, which is an absolutely terrific Chinese version of the D-18 and is all solid wood, built to Martin specs, and can be purchased brand spanking new for less than six hundred dollars. There are other fine alternatives instruments as well. No one should mistreat a D-18 by putting pickups onto it unless they're just that willing to be disrespectful to something so wonderful as a D-18, and so unworthy of abuse. There are many a fine mahogany body Alvarez, Yamaha, and Takamine instruments out there available new or used where one can either purchase with the electronics, or without the electronics and then add the most modern ones available for the best possible sound. Outside of the mahogany body steel string flat top dreadnought design, the most important things to consider for replicating this Nirvana tonality of the unplugged variety would be the stomp box distortion pedal and the Fender SF Twin Reverb amp. With a solid sitka spruce top as a sound board and mahogany back and sides, the Takamine fifty anniversary G series acoustic electric is more than just another great guitar from Takamine, it is a commemorative and rather ornate one too. This is the first limited edition G series guitar in Takamine's fifty years of providing high quality guitars to the world for a very good price. These guitars are available in both cutaway and traditional dreadnought configurations; and are rather ornate for their fiftieth anniversary abalone vine inlay on the fret board. With a mahogany body and sitka spruce top, this guitar will be loud, and notes will be more distinct and clear than a rosewood instrument. Plugged in, however, and played on stage is where this instrument will most shine. It is a beautiful steel string axe, and meant to be a stage instrument for a travelling musician. Some of the world's finest virtuoso acoustic players, men such as Brad Davis, are playing Takamine guitars on stage so as to keep that fine Martin D-28 or D-18 at home for use in the studio. These Takamine instruments come with above and beyond the pale electronics which optimize their efficiency and utility on stage. For only seven hundred dollars this instrument is an amazing value. Many such high quality and high value Japanese instruments are available, but this one is more attractive than some others for its inlay present on the fret board and the pick guard. The Takamine 50th anniversary G series is a much more affordable and practical guitar than the Takamine 40th Anniversary guitar. The 40th anniversary instrument is the kind of flat top one keeps at home, and the 50th anniversary six stringer one to use to play live in a club or on any stage anywhere. This commemorative fortieth anniversary dreadnought comes ready to plug in, and with Takamine's fine electronics, which have a well deserved stellar reputation, you can't be left feeling like you've got anything but the best to work with. The TP4T preamp system and the CP100 pickup are yours to use and play your magic for the crowds. The electronics on this guitar will bring out the best acoustic clarity possible. The design and themes of this guitar will never again be duplicated by Takamine. Once these instruments go out of production they'll never be produced again. This is the first limited edition G series guitar Takamine has ever produced, and it may be the last one as well. 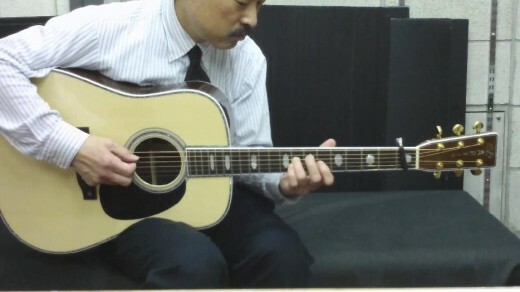 At just seven hundred dollars this guitar is everything one expects in a Japanese acoustic electric guitar, and exemplifies the high value of Japanese instruments. This six string original would not just make a fine stage instrument, but is also bound to wind up a collectible instrument as well. I've priced these guitars in used models on the web for as low as three hundred and fifty dollars, but those should only be purchased should one be comfortable with some scratches and scuffs from use in live music venues anywhere on this planet where musicians perform with fine instruments such as these. People come in all shapes and sizes, two sexes, and various ambiguities. In our lives a lot of us get a desire for a time, or for a lifetime, to make music. It's a simple fact the guitar is the most often used and desired instrument of the inspired musician. Every musical instrument is desirable and capable of making beautiful tonal artwork, but for whatever reason, it is the guitar most choose to use to see if they're music making desire is for a time, or forever. It's a simple fact the acoustic variety of the six stringed instrument we all know and love so well is the more favorable one for many an occasion, and this is certainly due to its not needing any sort of assistance for play from electricity or electrical gadgetry. The larger the guitar, the more sound the guitar can provide would be a general rule, but we all know there are many more factors involved, specifically, the quality of the wood, and the talents and education of the builder. It goes quite without saying that the builders down a C.F. Martin & Company are among the best in the world. Martin guitars was established in the USA in 1833, and probably, the Martin family were building guitars prior to immigrating to here. The Martin J-15 is not constructed with the classic dovetail neck joint, but rather, with the more modern Mortise/Tenon neck joint, which is a more modern, cost and time effective means of connecting the neck of a fine guitar to the body. The guitar is the standard 14 frets clear of the body. This guitar is constructed with all the master workmanship seen in ALL all solid wood construction Martin instruments, but the 15 series instruments are built to be not just heirloom quality instruments, but affordable ones. What this means is some less expensive materials are used. When I say "less expensive," it would be a huge mistake to assume this meant "cheaper." The bridge and finger board or fret board on this guitar are both constructed using rosewood. Rosewood is NOT a lesser wood than ebony for such things, it is ONLY a less expensive wood than ebony. Now, the tricky thing to discuss with this fine Martin J-15 steel string instrument is this, the woods used for the top and the body. This same bit of issue is the same with all Martin 15 series instruments. Martin regards sapele and mahogany as identical woods. They are nearly the exact same thing, but they are not exactly the same thing. Some 15 series instruments will have one for the body/sides, and the other for the top, or vice versa. I'm told the older Martin 15 series instruments were all mahogany, and the newer ones are all sapele. C.F. Martin guitars and Taylor guitars both consider sapele and mahogany as so very similar as to be the same. This particular subject is one which is often discussed on guitar forums, and probably will be for a significant time to come. This guitar features A frame X bracing, and the braces are made from sitka spruce. The head plate is East Indian rosewood as is the fret board and the bridge. Martin guitars tells me the bridge and/or fret board on some specific instruments will be of solid morado. Electronics are optional on this guitar. The width of the neck at the nut on this guitar is standard for Martin guitars these days, and it is 1 11/16". The all mahogany sound of this guitar leaves many musicians feeling it is best suited, as all all mahogany guitars are, for playing acoustic and/or country blues. I'm pricing this instrument used on the web at about $700. Needless to say, a new one will cost slightly over a thousand dollars. Mahogany is a much lighter weight wood than is rosewood, and this guitar is entirely of mahogany and/or it's very close cousin sapele, all throughout the body. Despite the larger than dreadnought sized body of this fine Jumbo sized acoustic guitar, it's not going to weigh a whole lot. Now mahogany when used in the body is well known to produce a lot of velocity of sound, but what about mahogany as a sound board on an all mahogany guitar like the J-15? Both Koa and mahogany have been used as soundboards or tops to fine acoustic instruments since the 1920's, and if you were to look at my thumbnail image here, you would see I am holding and playing an all mahogany Martin 00-17. Suffice it to say I know about all mahogany guitars, and how they differ from guitars with spruce tops. While mahogany bodies produce a high velocity of sound when compared to rosewood, mahogany tops or soundboards produce a much lower velocity of sound when compared to spruce tops or soundboards. One could describe the tonality of a mahogany top guitar as subdued, dark, or rather suited to blues music. An all solid wood guitar from a master corporation like Martin is a work of art, and it should be used to further the artistic skills and endeavors of an artist, and this guitar will suit any professional or armature musician very well for all of his or her lives. These jumbo sized guitars being somewhat large, one should typically be certain such an instrument is suited for them, as being able to handle such a guitar could be an issue for someone on the small size of the physical spectrum. All Martin guitars come with a limited lifetime warranty to the original owner and a hard shell case. Thanks for reading. Takamine instruments have been around for more than 40 years now. In fact, at this time Takamine's 50th anniversary model guitars are available, but looking through some old Acoustic Guitar magazines I found an article, a much shorter one than this will be, about the 40th anniversary Takamine guitar, and I was exceedingly intrigued by the facts of its construction. Now I do a lot of writing about acoustic musical instruments on the web, and I mean on this site, and on a few others as well. Most often when I'm talking about a six string guitar in an online article, I know that instrument, I've sat in guitar shops and played that guitar, and so I can tell you I know what I'm talking about. I can not do that with this guitar, and probably very few people can. The Takamine 40th anniversary guitar resulted in the production of just 40 of these instruments. Very few people anywhere can tell you first hand about this guitar. What I want to talk about concerning the thing is how frigging unique a guitar it must be. I don't know if too many peripheral six string fans have figured this out, or not, but the people who are rabid about guitars and guitar building are a pretty intellectual lot of folks. Building fine guitars is akin to being a sculpture in a way, except the guitars, the work of art they build, are then taken and used towards further works of art. Guitar builders are extremely interested in pieces of woods, taptones, and such; and what the combinations of woods and bracing they use to build a guitar is going to produce in the sonic sense. While I'm not any sort of professional scholar in regards to acoustic instruments, I'm sure enough an amateur one. I don't have transportation just now, so I do not get to visit music shops so much, but I'd never before heard of a guitar besides this one having persimmon wood used for its back and sides. I brought the topic up to an uncle who used to sell guitars, and knows quite a lot about them, and he'd said himself he thought I must be mistaken, that there would be a great challenge in finding persimmon wood slabs big enough to make a dreadnought guitar, and this Takamine 40th anniversary instrument is certainly a dreadnought. Persimmon as a tonewood is uncommon, very uncommon. Using Google search I searched terms "dreadnought guitar with persimmon back and sides," and I found only two entries that looked decent at first glance. A man in Eastern Tennessee named Cliff Hamby uses persimmon and other native trees to make hand made instruments, and another man named Bob Gramann, a newer builder. Persimmon wood is thought of as a native American ebony, and ebony, of course, has been used in acoustic instrument building for a very long time, and on the most expensive of instruments as the wood used for bridges and fretboards. My search results linked above for "dreadnought guitar with persimmon back and sides" were essentially completely useless. Those builders in the first two references aren't using persimmon for back and sides, but for fretboards or bridges, or both. So I hope the reader can see how completely intriguing this Takamine instrument truly is. This 40th Anniversary instrument from Takamine is a standard 14 frets clear of the body dreadnought. We've discussed the back and sides being persimmon, and the top is sitka spruce. 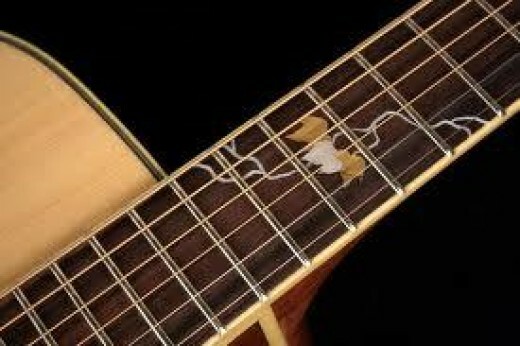 The guitar features abalone inlay binding, an abalone rosette; and a 40th anniversary commemorative ruby. Fretboard markers are bow tie style. The instrument has a strange two piece style saddle which I'm not exactly sure how to name properly. Only 40 of these instruments were made, and when new, they sold for $4,000. I priced one today on the web for $2,000 used. This is an extremely rare "bird," and I wish I could find at least a youtube video about it, but alas, I can not. The persimmon wood looks a lot like Koa, and I can only wish to hear what these beauties sound like. Steve Earle is an American singer, song writer, author, actor, and political activist. He's been a star, and he's been to prison, and then he's remade himself into a much better artist. Steve Earle, of course, is also a guitarist, and has always accompanied himself on records with one. Early in his career, Steve was more of a rockabilly sort of musician, and played electric guitars; but as he's gotten older, he's become devoted to acoustic instruments. Born in Texas in 1955, Steve spent years in Nashville, Tennessee; and now resides in New York City. As for myself, I've always been a huge fan of Steve Earle, and what I have always appreciated was the way he's never been one to try to make "hits," he's a guy who has always had serious subject matter that was closest to his heart, and so pretty often, his songs are about controversial topics. The man, however, also has a serious sense of humor. Steve Earle's music spans a lot of styles. Some of his music could nearly be considered "rock music," and other things were once country music radio staples. He's done albums that were straight Bluegrass music, and he's done a lot of things with some dark country music themes. He's lived a rough life, drugs and alcohol, seven marriages, prison. Mostly, Steve Earle's albums have some of this, some of that, and some of the other all inside. My personal favorite is called Train a' Comin', as it features multi instrumentalist folk master, Norman Blake. I'm a huge fan of Steve's, but I have to admit that I've not read any of his books. I'll remedy that at some point in time should I get the chance. 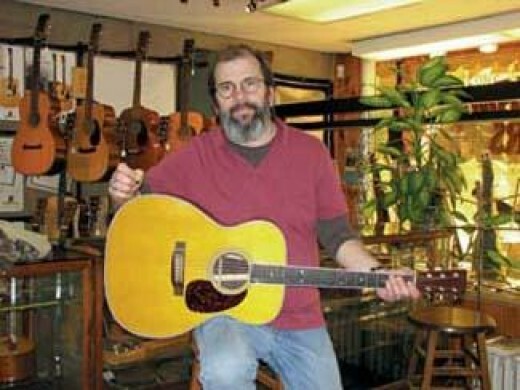 It's little wonder the world's most renowned guitar builders built a guitar for an American classic like Steve Earle. 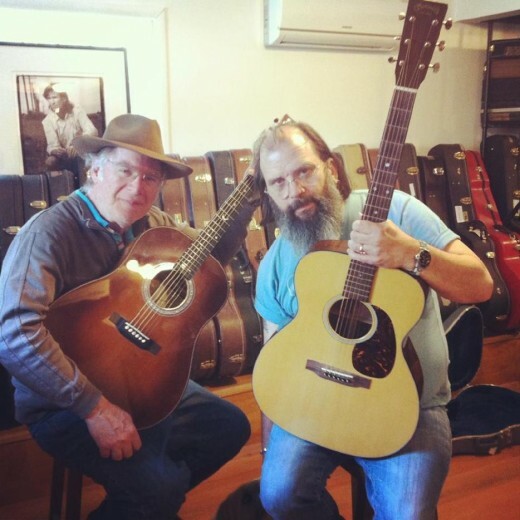 Steve Earle and Martin guitars go together live the proverbial peas and carrots. This is, however, not a guitar you will often see, and it is similar to the Martin D-18 Gordon Lightfoot in that it isn't in production any longer. None of this means, however, that a demand won't at some point or another reintroduce the guitar to standard production, and Steve is still around to sign them, and we hope he will be for a long time to come. So what the heck is an M-21? I've never heard of anything like that? Well, there's nothing really strange or odd about the "M" body style guitars by C.F. Martin & Company at all. These guitars are actually pretty popular, and a lot of renowned guitarists who aren't exactly famous, play them exclusively. People like David Bromberg come to mind here, as he also has his own "M" body design produced by Martin. The most common of the "M" body guitars is probably the Martin M-38, the David Bromberg guitar is an M-42. Essentially, an "M" model acoustic guitar, is the same shape as is an OM, or "orchestra model," but the overall size of the "M" guitars is larger, despite being proportionally the same as OM's, just larger. Did that make any sense? I hope it did. Whenever you are looking at, or reading about a Martin guitar, the number after the letter tells you how expensive the guitar is going to be. Why more expensive? Well, with Martin guitars, more expensive DOES NOT mean "better," it only means MORE EXPENSIVE. For these reasons, this Steve Earle signature guitar is going to be priced really well until its no longer in production status drives the market price for the thing upwards. Don't let the enlarged OM or "orchestra model" design of these guitars fool you, these M body guitars are actually larger instruments than a Martin dreadnought, like a D-28. Like I'd stated before, Martin guitars aren't priced for their size, their price is generally indicated by the number following the letter. I'm pricing this instrument on the web for $4,299 dollars. It is a custom guitar, and they're all signed by Steve Earle; so this guitar is a bit more expensive than it otherwise would be. The exact dimensions of this guitar are those of a 0000 body with a 000 body depth This is absolutely a "high X" guitar, which is to say it features forward shifted scalloped X bracing. All such instruments are fragile, but are built for someone desiring the best in sound the most known for it on the planet manufacturer can offer. When you buy something like this, you go in knowing you're purchasing a very precious and fragile thing that requires attention to care. The back and sides are of East Indian rosewood, and the top is Alpine spruce. It is an entirely all solid wood guitar. The neck is carved from mahogany, and the fretboard and bridge are of East Indian rosewood as well. The rosette is style 18, but the backstrip is style 28. Waverly tuning machines can't be beaten, and those are what are used here. "Doppler Dot" fretboard position markers are used, and this is unique to Martin "21" style guitars. Martin's polished gloss lacquer finish is the standard everyone else is measured by; and it will shine for quite a long long while, showing off that top grade wood that produces such crystalline tonality. 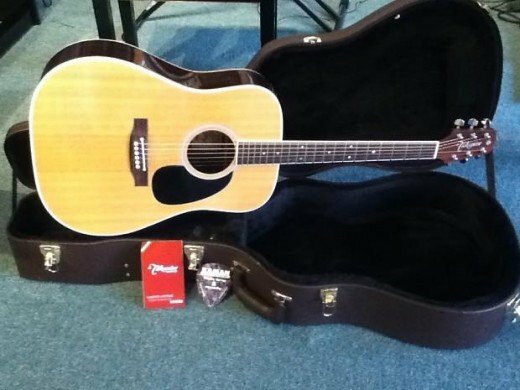 All Martin guitars come with a full limited lifetime warranty to the original owner, and a deluxe hardshell case. Let's hear ol' Steve pick one, shall we?